Last weekend I went to Lake Grace which is about 4 hours or so driving south of Perth. We went through here many many years ago on our way to Esperance - I turned off Albany highway and through Wagin - the home of Woolarama and the giant ram. I didn't take any photos on my way down - just thought it best to drive - I took lots of cds and wound the sound up. What a lovely weekend - 13 wonderful women all very creative and ooh - country hospitality. I put back on one of the kilos I had taken off. I also had a very hospitable host in Tania - thank you - flannelette sheets I have not had on a bed since we left NZ. I also took my pop up shop which was well received. We played with all sorts of things - at the top is a Qantas serviette - yes I still have plenty to share. I haven't names for the owners of each piece but it is always amazing to see what people come up with and the beauty of running a workshop is that I learn new things and come home with ideas to try out. 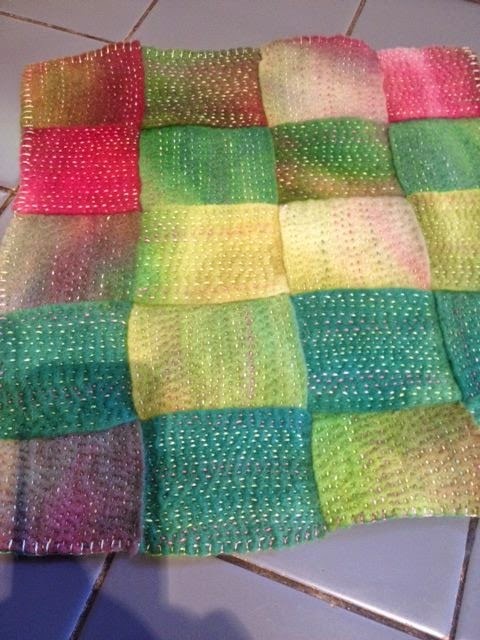 Here is aome wonderful weaving (something dear to my creative heart) - I love the colours she has used. and of course we played with paper napkins - why not? As you can see they were pretty productive. I drove back on Sunday night in time for a glass of wine but not dinner - never mind I had eaten far more than I should have over the weekend. Thank you so much to the lovely Lake Grace and surrounding - ladies for a wonderful weekend. This week we have been working on the e-mag - Issue 5 is getting closer - it has been raining a lot and quite cold - I watched the replay of the All Blacks versus England game and am looking forward to today's game. And i am putting my stuff away - gathering my stuff for my trip to Rockhampton next Friday where I am so lucky to have been asked to be a guest artist - I shall be playing away on an embellisher and with my flower stitcher. I have also purchased a new suitcase extra so I am bringing two suitcases - not sure what to take as yet! I also want to thank Felicity from Norseman who sent me some fab Japanese papers for my upcoming project. You didn't give me your address so I could send you some threads! 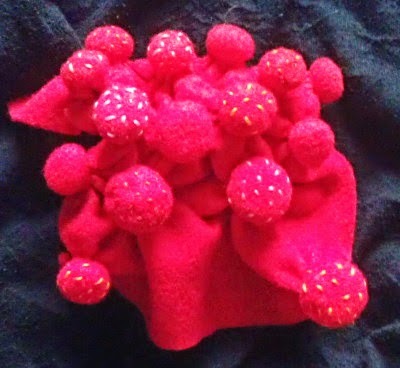 I have had three wonderful people testing the thermo felt for me and I have been playing with it as well. So much potential for experimenting for shapes and moulding - hope you enjoy reading what we have all done. 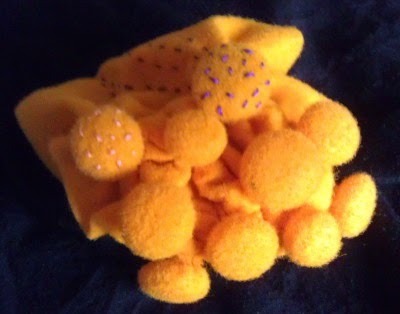 Thermoformable wool felt is made from wool and polyester (90% wool-10% polyester). It can be used as a wonderful felt for backgrounds and stitching but it contains enough polyester to enable it to be moldable. Thermo Felt can be permanently shaped and creased under heat. It will retain the shape you create before you apply heat. 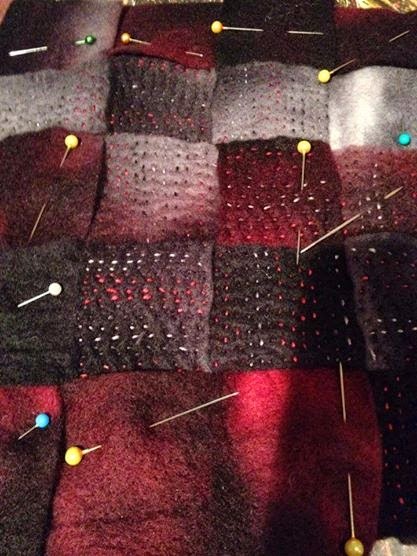 You can stitch it and shape it first and then apply the heat. This is a very new fabric for those of us who just love to experiment. The possibilities of 3D is exciting. Before you do anything else – soak it in boiling water first to open up the fibres. It makes it nice and soft if you plan to stitch on it and it has that wonderful sheepy smell. 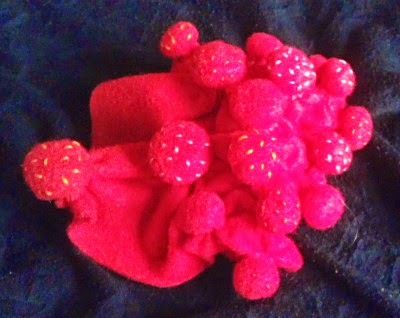 Let it dry and then shape and/or stitch as desired. Don’t expose the felt to an open flame and be very careful when handling the felt when it is hot. Try pleating or creasing the Thermo Felt. Fold the fabric concertina style (or tuck into a ready made pleater) and with the folds pointing vertically, press a steam iron over the top, flip it over and heat the other side. Make sure you use lots of steam. I have quite a powerful steam iron. Try stitching lines first before you steam. I have done some playing so far - with steam. I used the method I've been using mostly for my shibori-ied scarves, knowing that the polyester content should respond to steam. I've also tried shaping little offcuts with steam and tentatively tried the microwave. It's a really interesting material isn't it? Lots of fun and I think I like the sculptural possibilities the most. The purple and black are Merino/Alpaca/Silk blends that I machine needlefelted. 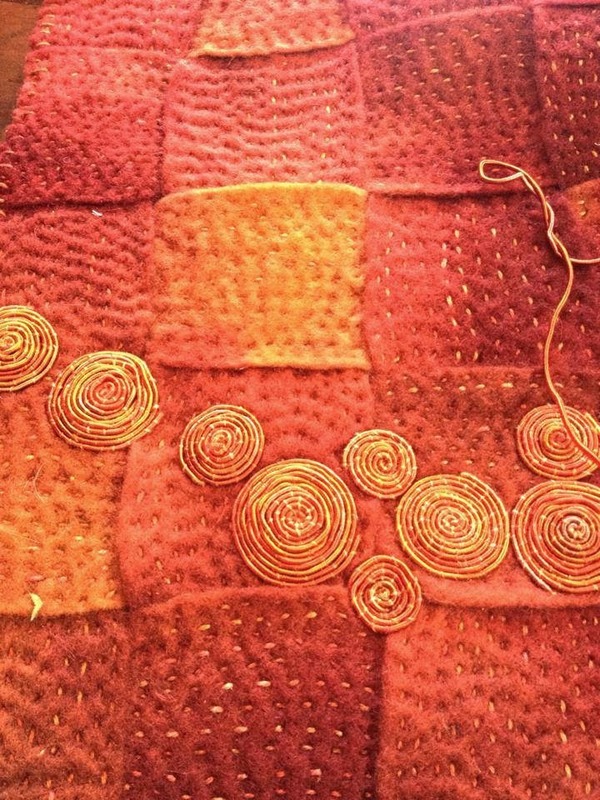 The orange is hand-dyed muslin strips. There didn't seem to be any change in colour (or burning) after 20 minutes in the oven. I used ceramic baking beans to help weigh it down. Even before the cooking, the felt was holding the shape of the container quite well. Felt slashed with craft knife, then layered with silk and synthetic organza. Overlaid with tuile and machined. Burnt back with heat gun and cooked in the oven for 20 minutes. Rubbed with Shiva Paintstiks.